If you review the courseware for one of our books, you’ll see that it includes everything you need for running successful courses that actually improve performance on the job. What follows is a brief summary of our typical courseware components. These folders and files are available to the trainees as a download from our site, so they can set up their own computers. But you don’t have to download them, because they are also included in the FREE courseware for trainers. Since we believe that instructional objectives should be the start of any educational methodology, our courseware includes a set of objectives for each chapter in each book. We develop these according to the principles presented by Robert F. Mager in his classic book, Preparing Instructional Objectives. As a result, our objectives describe the skills that your trainees should be able to do when they complete a chapter. We divide our objectives into two categories. Our applied objectives ask the trainees to apply what they’ve learned as they develop applications. These are the critical objectives of a course, and they are best tested by having the trainees do exercises and projects like the ones that we provide. In contrast, our knowledge objectives define skills like identifying, describing, and explaining the required concepts, terms, and procedures. These objectives determine whether your trainees are able to talk intelligently about the topics that are presented. And these objectives can be tested by the test banks that we provide. To help you get the most from the instructional objectives, we include them at the start of the PowerPoint slides for each chapter, as shown above. As we see it, if you can convince your trainees that they only need to be able to do the skills that are described by the objectives, their study becomes more focused and efficient. For many courses, the chapter exercises in the book will be all you need to get your trainees to practice and refine the critical skills of each chapter. But for most of our books, we also provide one or more sets of extra exercises. That includes: (1) a handout that describes the exercises; (2) the starting folders and files to distribute to your trainees; and (3) the folders and files for the solutions so you can demonstrate and review them in class. You can use these extra exercises as an alternate to the book exercises. 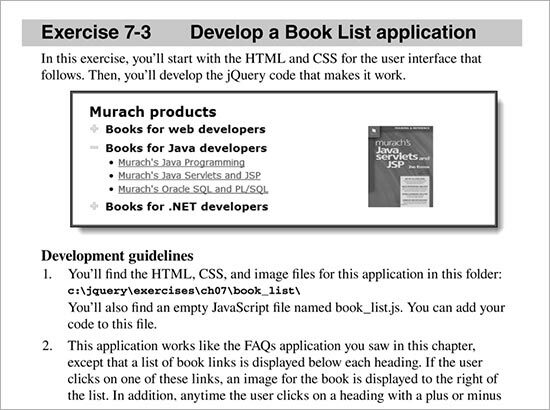 Or you can use them along with the book exercises to enhance your course as you see fit. For instance, one way to use the extra exercises is for quizzes or tests. Another way is to provide quick reinforcement for a skill you’ve just presented. A third way is to expand your trainees’ understanding by having them apply the skills they’ve just learned to problems that are different than those in the book examples. Call it a quiz, call it a test, call it reinforcement, call it classroom stimulation: the extra exercises can make any course more effective. For many of our books, we also offer projects that continue from one chapter to the next. Then, each project represents a single application that is started from scratch after the first section of the book and can be enhanced by using the skills of each subsequent chapter. 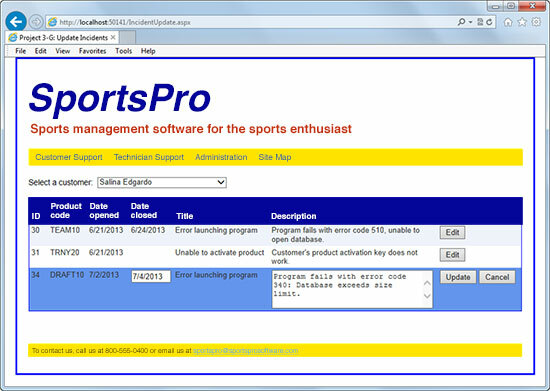 For instance, the example above is one page of a technical support web application that can be used with our PHP book. This application starts with two web pages that the trainees build from scratch after they complete chapter 6. Then, they add pages to the application after they complete subsequent chapters. To be honest, most trainers don’t use the projects because they’re too time-consuming, and their trainees will be going back to work on real-world projects anyway. If you need them, though, our projects provide a great way to test whether your trainees have mastered the skills of the course. Each test bank provides questions that are designed to test the skills that are described by the objectives for that chapter, and each test question is designed to test the skill described by one objective. This keeps the promise to the trainees that they will only be expected to do the skills that are described by the objectives. 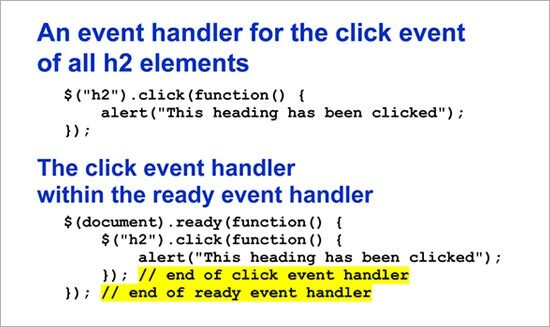 The example above shows a short test generated from the test bank for chapter 7 of our jQuery book. 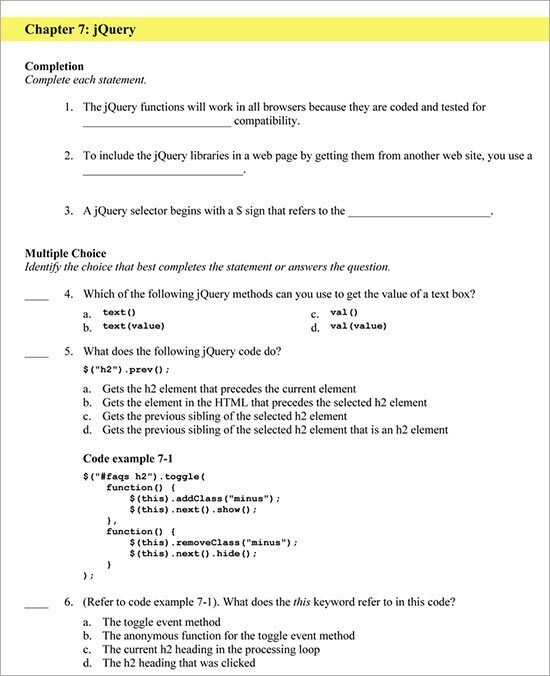 As you can see, we use only completion and multiple-choice test questions because they have the highest validity. In other words, the trainees who get the best scores are the ones with the best knowledge and skills. In contrast, matching and true/false questions have low validity, so we don’t use them. The PowerPoint slides present all of the critical information that’s presented in the figures of the book – the righthand, illustrative pages in our paired-pages format. That includes all of the screen shots, diagrams, tables, and code that you may want to review in class. As a result, these slides make it easy for you to review any of the skills that your trainees have difficulty with. Beyond the book information, the slides for each chapter start with the instructional objectives, so you can review them in class. 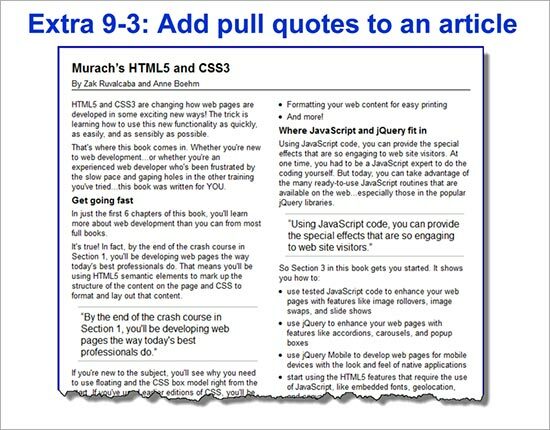 In some of our books, the slides for each chapter also end with the screen shots for the book exercises, as well as for any extra exercises that we offer. That makes it easy for you to answer questions and provide additional information about these exercises. 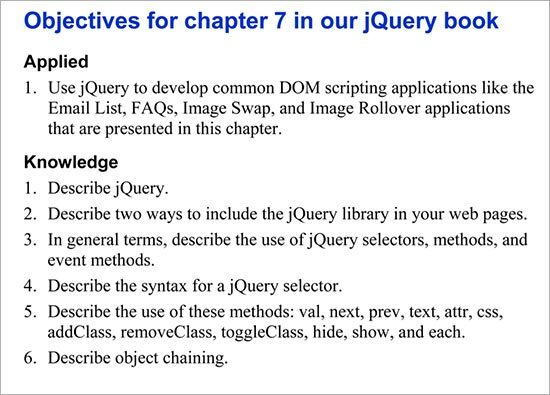 To see how our slides work, you can run the slide show for chapter 7 in our jQuery book.